The outline and bottom shape have been designed to shoot-out at the first foot pressure and keep accelerating where a traditional wave-board peaks out. Balance, stability and aptitude to re-locate in non-planning mode: Get quickly back to the peak; keep your feet in the straps, get-up and plane at the first puff. – Optimized width/thickness ratio: a slightly wider but thinner board. – Double concave bottom: long and slightly hollowed, to increase speed potential. – Slight Vee on the whole length: to improve control and maneuverability. Its outline is inversed aft, which hangs-on better and offers more grip and tighter more precise- curves. The thruster fins slice through the water without failing under foot pressure. Excellent « strapless » performance has been a key target of this new shape, with an ability to turn at slow speeds and remain flat on the water in the lightest conditions. 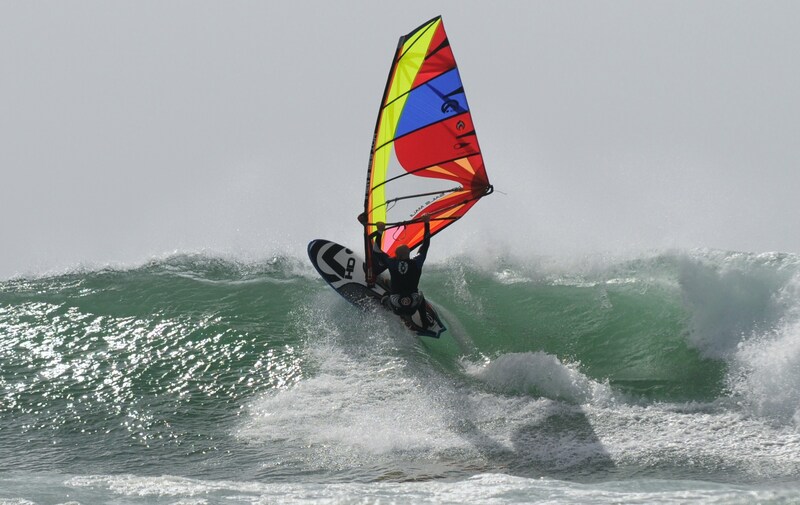 « Strapless » sailing, is exhilarating, it will help you improve our surfing and develop a better feet stance! Without a sail, with or without foot-straps, with or without wind!